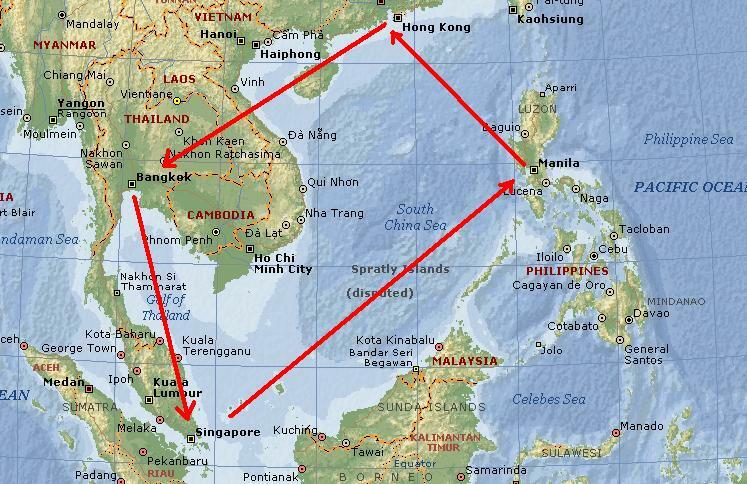 The plane ticket route I purchased yesterday. I have purchase an interesting trip for the next 30 day; it will end in Bangkok when I am done. However mostly I will spend a couple of weeks in the Philippines. Unfortunately, this trip is mostly a business trip; however, I hope to get to the beach in the Philippines. Singapore, Macau, and Hong Kong are not high on my want to visit places on the planet, so I am in and out quickly. However, I am looking for more bases of travel where I can explore more place from and return. To really travel the world in pleasure I feel I need to sometimes travel very light, however to really enjoy my trip I need to have a lot of weight. So I need both a lot and a little with me at the same time, this is a puzzle, how do you have a lot of weight about 40 kilos or 80 pounds and then travel with only about 15 Kilos or about 30 pounds some of the time? The way you travel very light, but have a lot of weight in luggage is to have a base camp. A starting and ending point, fly into the base camp, as is Bangkok presently here for me, then fly to other locations from there and then return with a light bag. 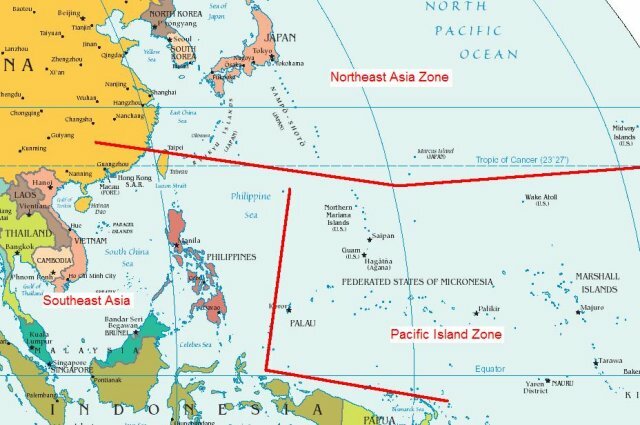 I am looking for base camps in this area, it could maybe be Bali or Jakarta or who know for sure in the Islands areas, it could be Darwin in Australia, I am sure this is obvious to someone. The problem with a base camp is I want two things; I want a cheap and easy place to live like Bangkok however, I also want to be able to purchase tickets CHEAP and easy with lots of competition for the sale of Air Tickets. I do not know how a country does it, however most of the countries on the planets stop free competition of airlines. They seem to somehow create an environment where everyone agrees to only sell round-trip ticket or return tickets in the English way of talking. Some countries are just plain obnoxious in the way they control plane tickets, therefore killing the majority of their possible tourism business. Two prime examples is the Philippines and Brazil, these are two of the best places on the plane for tourist to visit and they have successfully stopped most of the tourism, they are probably only getting one-third the percentage of tourist that should be in the countries. A combination of difficult Visas, bad plane competitions and some a governmental controls that seem crazy to me. I am not going to say it is crazy, just seems crazy, I do not think that country should encourage tourism, I think it should be easy for a person to visit, I do not think the government should have more than about 5 percent of any income for the country from tourism. I was walking by the Chabab House near Khao San Road and looked over to the doorway, there is this person checking backpacks for bombs. The Chabab house is some form of extreme Israel Hotel or Hostel for the extreme level of Jewish person. I am not sure how it works and really do not care, they at time push up there with the Islamic religion and really are the same in many ways with their too much or too much religious crap. Nonetheless the do ask for problem sometimes and the Chabab House is a perfect target for an Islamic Bomb in the Khao San Road area. This is like an inevitable event, there will be a bomb on Khao San Road, and the question is where and when. I think they will choose one of a couple, probably one of the clubs, Sunset, or Gulliver’s, there is another however I do not know the name. Nonetheless for a year when they do this or on Koh Samui the country of Thailand will be an economic disaster zone. This is because I would guess that more than 5 percent of the economic wealth of Thailand comes direct or indirectly from Tourism. I have a minimum chance of being involved in one of these bombs because I do not live in an Israel Hostel, or go to the clubs involved, I also have no use for the island of Koh Samui. What I am looking for primarily is a way to explore the Indonesia or Micronesia Island areas easily with a minimum amount of travel stupidity. Defined as when you have too difficult plane tickets, gouging of hotels, and transportation that is overpriced. My guess is Singapore is one of these places, a place where they want to be like Europe and try to maneuver the prices to go along with this. Singapore is surrounded by countries that are very cheap, and there is very little to look at in Singapore except some big buildings, so why would I want to pay a lot to stay in a big city. Many people need to do this I was in New-York-or-Los-Angeles mentality. Singapore is I was in a big city bragging rights type travel. There is a marginal difference between any big city and another, they all are terrible stressful, expensive and over-priced. However for sure there are some exceptions like Bangkok or Quito Ecuador or maybe Riga, Latvia. These are the best base camp cities as you can make some serious financial choice mistakes and not lose the bank. One wrong move in Amsterdam and you pocket has 100 dollars less in it, this is a very annoying thing to happen. Yes most travelers or tourist avoid this by an extreme amount of planning, however if I have to live planning this hard, I will stop traveling and go home and forget this travel. Nothing is more stressful than places like Amsterdam or maybe… New York, City. How can a person go to New York City for less than having 100-200 Dollars per day in my pocket? This is not a vacation; this is work, or selling of my soul to visit a city. I am not saying I do not think they are not full of places to see or must see, I am saying the whole planet has this type of must see crap and in the end nobody cares, except for me, I am not a city boy so who wants to go listen and feel a bunch of aggressive city people with no manners. I have that in Bangkok and it only cost me 6 dollars per night for a Hotel. I could though get to Singapore and find it is very easy…. I doubt it or all the backpackers would have it on their list. Bali is on all the backpackers list, not Singapore.